1) High level modules should not depend upon low level modules. Both should depend upon abstractions. 2) Abstractions should not depend upon details. Details should depend upon abstractions. 1) When you write an ASP.NET application, you lie into the ASP.NET page life cycle, but you aren’t in control while ASP.NET is. 2) When you write a WCF service, you implement interfaces decorated with attributes. You may be writing the service code, but ultimately, you aren’t in control while WCF is. More over IoC is a generic term and it is not limited to DI. Actually, DI and Service Locator patterns are specialized versions of the IoC pattern or you can say DI and Service Locator are the ways of implementing IoC. 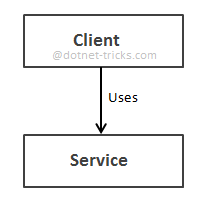 For example, suppose your Client class needs to use a Service class component, then the best you can do is to make your Client class aware of an IService interface rather than a Serviceclass. In this way, you can change the implementation of the Service class at any time (and for how many times you want) without breaking the host code. 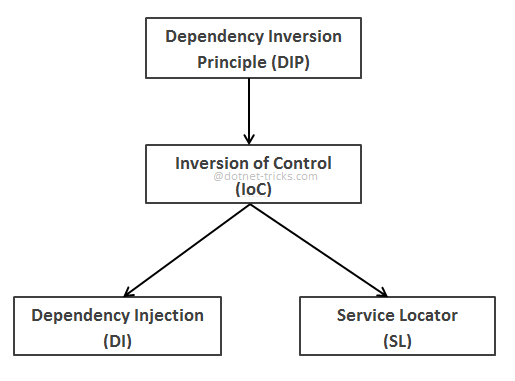 The terms Dependency Injection (DI) & Inversion of Control (IoC) are generally used interchangeably to describe the same design pattern. The pattern was originally called IoC, but Martin Fowler proposed the shift to DI because all frameworks invert control in some way and he wanted to be more specific about which aspect of control was being inverted. The Dependency Injection pattern uses a builder object to initialize objects and provide the required dependencies to the object means it allows you to "inject" a dependency from outside the class. Service Locator is a software design pattern that also allow us to develop loosely coupled code. It implements the DIP principle and easier to use with an existing codebase as it makes the overall design looser without forcing changes to the public interface. 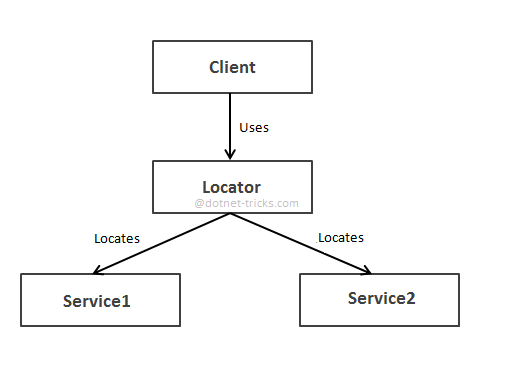 The Service Locator pattern introduces a locator object that objects is used to resolve dependencies means it allows you to "resolve" a dependency within a class. Let's consider the simple dependency between two classes as shown in the fig and it is a simple approach, which you know. Clearly, the Client class has a dependency on the Service class. If you want to make it loosely coupled, you have to use IoC to make the more flexible and reusable it. To implement the IoC, you have the choice of two main patterns: Service Locator and Dependency Injection. The Service Locator allows you to "resolve" a dependency within a class and the Dependency Injection allows you to "inject" a dependency from outside the class. The above code can be re-written as by using Service Locator as follows. 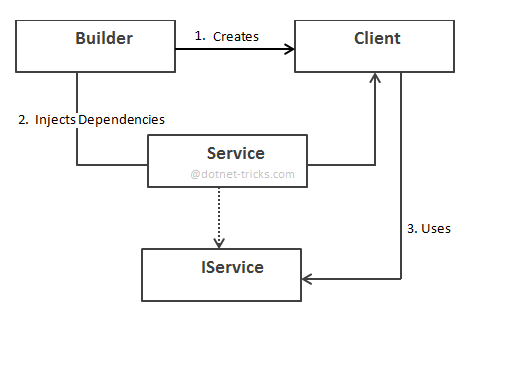 The Inversion happens in the constructor, by locating the Service that implements the IService-Interface. The dependencies are assembled by a "Locator". The above code can also be re-written as by using Dependency Injection as follows. What's wrong with the above two approaches? 1) It is hardcoded and can't be reused across applications, due to hardcoded factories. This makes the code stringent to particular implementations. 2) It is Interface dependent since interfaces are used for decoupling the implementation and the object creation procedure. 3) It's Instantiating instantiations are very much custom to a particular implementation. 4) Everything is compile time since all the dependent types for the objects in the instantiation process (factory) have to be known at compile time. IoC containers is the solution to resolve above two approaches issues. Hence, when we compose applications without a DI CONTAINER, it is like a POOR MAN’S DI. Moreover, DI CONTAINER is a useful, but optional tool. 1) When you use a service locator, every class will have a dependency on your service locator. This is not the case with dependency injection. The dependency injector will typically be called only once at startup, to inject dependencies into the main class. 2) The Service Locator pattern is easier to use in an existing codebase as it makes the overall design looser without forcing changes to the public interface. Code that is based on the Service Locator pattern is less readable than the equivalent code that is based on Dependency Injection.